Taxpayers reported $9.2 trillion of total income on their 2013 tax returns, a similar total amount to 2012. Seventy percent ($6.5 trillion) of total income reported on the Form 1040 is in wages and salaries, and about 83 percent of all tax filers report wage or salary income. In order to substantially increase revenues, policymakers generally have to look to labor compensation as the main tax base, simply because of its sheer scale. Pensions and retirement accounts make up a substantial portion of income, broadly benefiting the middle class. Pensions and annuities ($639 billion), IRA distributions ($214 billion), and Social Security ($243 billion) combine to create $1.1 trillion in retirement income. Business income is also a large feature of the individual tax code. Some businesses, like S corporations, sole proprietorships, or partnerships, file their taxes through the individual tax code, accounting for $908 billion in personal income. Capital gains and dividends accounted for about $806 billion in income in 2013, down from the previous year due to reduced realizations from the fiscal cliff tax hike. The individual income tax is the federal government’s largest source of revenue. Over 147 million individual income tax returns were filed for the year 2013, and in each of these filings a taxpayer added up his or her income in order to report it to the Internal Revenue Service (IRS). The way that the IRS individual income tax form (Form 1040) is structured, one first lists all sources of income on the front side of the form, adding these up to reach “total income.” After this, the tax return moves on to deductions and credits. This report will focus on sources of total income in 2013, which was reported as $9.2 trillion. It will break down that income into the component parts, reported on lines 7 to 22 of the 2012 Form 1040. Going through the amounts of income reported for each of these categories is a useful and instructive exercise for two reasons: it can help us understand the composition of the government’s revenue base, and it can help us understand how the rewards of economic activity are distributed in the U.S. economy. It is often helpful to divide income into four major categories: wages and salaries, business income, investment income, and retirement income. This report will examine and describe each of these four categories in turn. Source: IRS SOI Table 1.3. For most tax filers in the U.S., the largest number on the 1040 comes on line 7, the very first line pertaining to income. It is on this line that taxpayers mark wages, salaries, tips, and other compensation for their work. Most Americans get that number from their W-2 forms, supplied by their employers. In total, 122 million tax filers reported $6.5 trillion in wage income, or 70 percent of total income. Most Americans report labor income, and most of their income comes from labor. This should not be a surprise; the U.S. is a nation of workers, and most of its economy is labor compensation. Any meaningful attempt to raise revenue through the income tax will almost necessarily include wages and salaries in the base, just by virtue of the arithmetic. One cannot raise much income tax revenue by excluding 70 percent of income. The amounts reported on the 1040 reflect most, but not all, labor compensation. Firms also pay for employee health benefits and make contributions to Social Security. While employee health benefits aren’t taxed at the individual level, the Patient Protection and Affordable Care Act levies a “Cadillac Tax” on some health plans. Furthermore, contributions to Social Security are made through payroll taxes. In other words, while certain worker benefits aren’t counted as personal income, they are involved with the IRS through other taxes. In the United States, the dominant tax filing structure for firms is to file taxes as “pass-through” entities, so labeled because their income immediately passes through to the individual owners for tax purposes, without the business itself paying an entity-level tax like the corporate income tax. 95 percent of businesses use this structure, and their income shows up on schedules C, E, and F on individual tax returns. While some pass through businesses are quite large, the majority are sole-proprietorships, fully owned by a single individual. Pass-throughs employ the majority of the private-sector workforce in the U.S. and account for the majority of all business income. Partnerships and S corporations accounted for $614 billion of net income in 2013, and individuals reported an additional $302 billion of business income. This kind of income is distinct from the sort of investment income earned by shareholders of large multinational corporations, in that it often represents compensation for labor—especially for small pass-through businesses like dentists’ offices. The investment income earned from large publicly traded corporations is described in the category below. Certain kinds of income are taxed at what appear to be lower rates—specifically, qualified capital gains and dividends. They draw a lot of scrutiny because of this apparent preference, and also because they fit into the larger debate about income inequality. Rhetoric about corporate income is often expressed in terms that exaggerate the impact of shareholder income on personal income and income inequality. The returns to corporate equity, as found on individual income tax returns, are substantial, but much more modest than the rhetoric might imply. Taxpayers reported $215 billion of taxable dividends in 2013, and $483 billion of net capital gains, only some of which come from the sale of corporate stock. While these amounts certainly matter, they are substantially smaller than the $6.5 trillion of labor income described previously in this report. 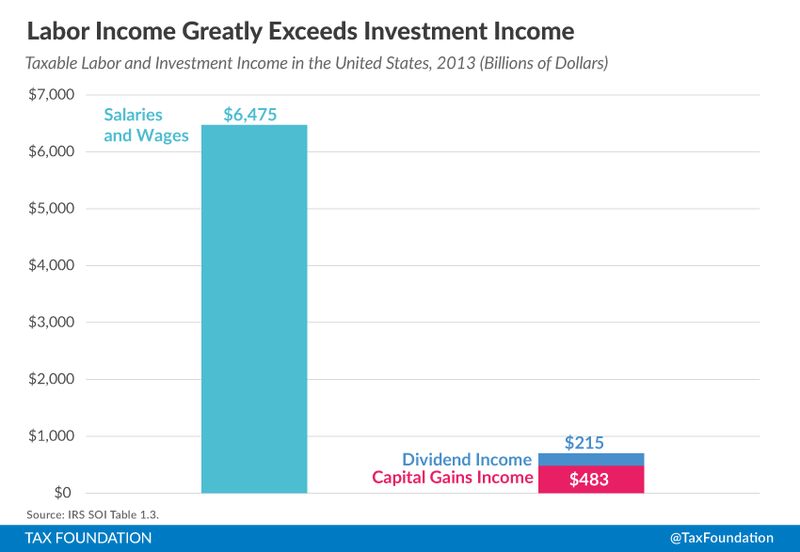 The amount reported in capital gains and dividends belies several popular notions about capital income: for example, the notion that corporations are using their revenues primarily to compensate owners, not workers, or the idea that there is a large idle capitalist class that makes its money from corporate ownership without work. In truth, taxable labor compensation greatly exceeds taxable investment income (Chart 1). It also contradicts the notion that increasing taxes on investment income would have a substantial effect on the U.S. budget deficit, or allow substantial tax cuts for labor income. It is simply too small of a portion of the economy, and the math for such proposals simply doesn’t add up. The data for 2013 are particularly noteworthy because a tax increase on this kind of income was enacted as part of the fiscal cliff deal. 2013’s capital gains realizations, at $483 billion, are 22 percent lower than the realizations from the year prior. This substantial reduction in realizations actually meant that on net, the tax increase lost revenue. In addition to the problem of delayed realizations, capital gains and dividend taxes have several problems: despite superficially preferential rates, they are structured improperly in a way that creates a bias against saving, harming economic growth. A multi-part tax system on saved income, where the principal is taxed at ordinary rates and then the returns are later taxed at lower rates is a much less favorable tax regime than a cursory look at the lower rate would suggest. The unfavorable tax regime results in a lower long-run capital stock, reducing economic output. It would be far better to tax capital income at ordinary rates, but allow individuals to deduct their contributions to investment accounts—in other words, all saving should have the treatment that Individual Retirement Accounts currently have. This kind of taxable income will be described in more detail in the next section. In 2013, taxpayers reported a total of $639 billion from pensions and annuities, and another $214 billion in Individual Retirement Account (IRA) distributions. America’s system of retirement accounts, while fragmented in several different programs, is taxed in a neutral way that removes the bias against saving. Furthermore, it actually works fairly well at providing people income in their retirement. Notably, the income from retirement accounts is now a little bit larger than the investment income earned outside of that system. The CBO’s system of categorization is very defensible, but it can also lead to some poor reasoning. The report found that capital income—as defined on its terms, was very unevenly distributed; only the wealthiest Americans relied on it as a substantial source of income. It is important to remember this definition, though, and not conflate two ideas. The first idea—that middle-class Americans don’t report many dividends or capital gains on their 1040s—is true. A second idea that would appear to follow logically—that middle-class Americans don’t earn substantial returns to capital—is false. Middle-class Americans just wisely put their capital in retirement accounts—where it enjoys a proper tax structure—instead of keeping the money out of retirement accounts and subjecting it to a poor tax structure. 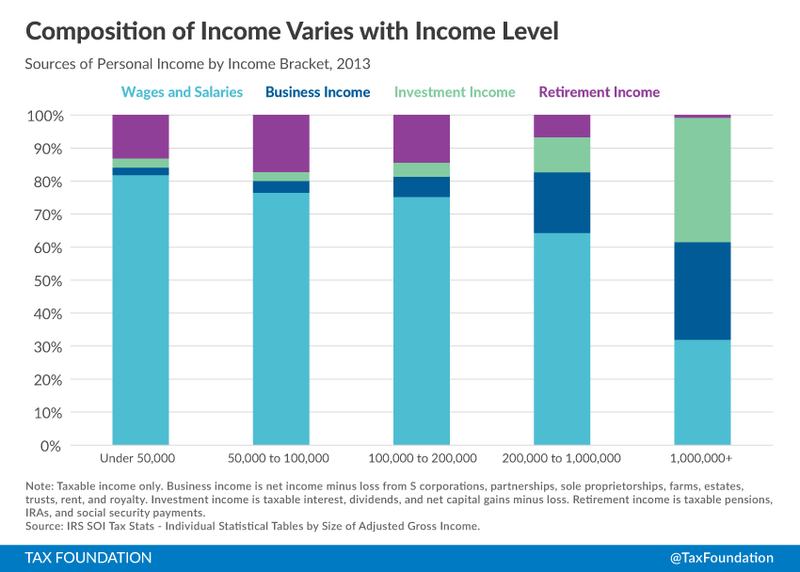 A look at personal income by income bracket shows the importance of retirement income to the middle class (Chart 2). Retirement income is most important as a source of personal income—about 17 percent—for taxpayers reporting between $50,000 and $100,000 of income. In practice, of course, this means that a minority of middle-class taxpayers—the retirees—rely on this income quite a bit, while the majority, those of working-age, do not. A walkthrough of personal income reveals many things about our tax code and our economy in general. Our personal income tax is largely a tax on labor, primarily because our personal income largely comes from labor. However, there are some varied sources of capital income in the mix as well. While these sources, even when combined together, are small compared to labor income, they are still significant and need to be accounted for well, both by policymakers trying to draw in revenue efficiently, and by economists or journalists attempting to understand the distribution of personal income. Source: IRS SOI Tax Stats, Individual Statistical Tables by Size of Adjusted Gross Income. Source: IRS, Table A. Selected Income and Tax Items for Tax Years, 1990-2012, in Current Dollars. IRS Statistics of Income Tax Stats, Table 1.3, http://www.irs.gov/uac/SOI-Tax-Stats-Individual-Income-Tax-Returns-Publication-1304-(Complete-Report). There are limitations on using data from the 1040 to understand the nature of income in the U.S. economy. Not all economic activity finds its way to personal income tax forms—particularly, employer-provided health insurance and returns to owner-occupied housing are both substantial components of economic output that do not appear on income tax returns. As broad economic aggregates, though, the categories of income established on the 1040 are still useful and instructive. IRS SOI Table 1.3, supra note 1. Alan Cole, A Walkthrough of Gross Domestic Income, Fiscal Fact No. 467, Tax Foundation, May 20, 2015, https://taxfoundation.org/article/walkthrough-gross-domestic-income. 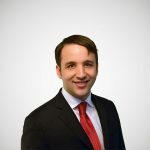 Kyle Pomerleau, An Overview of Pass-through Businesses in the United States, Special Report No. 227, Tax Foundation, Jan. 21, 2015, https://taxfoundation.org/article/overview-pass-through-businesses-united-states. William McBride, Federal Government Lost Money from 2013 Tax Increases on Investors, Tax Policy Blog, Tax Foundation, Jan. 29, 2015, https://taxfoundation.org/blog/federal-government-lost-money-2013-tax-increases-investors. Kyle Pomerleau, The High Burden of State and Federal Capital Gains Tax Rate, Fiscal Fact No. 414, Tax Foundation, Feb. 11, 2014, https://taxfoundation.org/article/high-burden-state-and-federal-capital-gains-tax-rates, and Kyle Pomerleau, The United States’ High Tax Burden on Personal Dividend Income, Fiscal Fact No. 416, Tax Foundation, Mar. 5, 2014, https://taxfoundation.org/article/united-states-high-tax-burden-personal-dividend-income. Congressional Budget Office, Trends in the Distribution of Household Income Between 1979 and 2007, Oct. 2011, http://www.cbo.gov/sites/default/files/10-25-HouseholdIncome_0.pdf.